Willis Green Craig was born September 24, 1834 on his father’s estate named Waveland near Danville, Kentucky. The infant boy was named for his mother’s father, Willis Green, who moved to Kentucky from Virginia in 1783 and was actively involved as a Jeffersonian in the national and state political issues of the day. Baby Willis’s father, William, was a prominent local physician who had purchased Waveland from the brother of his wife, Martha Eleanor Green. Living conveniently near Centre College in Danville, young Willis began his studies during the college presidency of the Presbyterian minister, John C. Young. Willis completed his work in 1851 graduating just three months shy of his seventeenth birthday. John James Craig, Willis’s brother, was managing Waveland at the time, so he asked his college graduate brother to help with the farm. Willis worked with John operating the farm for seven years as he matured through his work experiences with his brother. When Willis Craig began his preparation for the ministry it was natural, as he had done for college, to look to the city of Danville and its seminary. He studied there for about two years ending in 1859 and it is not clear whether he completed the full curriculum. Regardless of the extent of his formal divinity studies he was found sufficiently qualified by the Presbytery of Sangamon in Illinois to be a licensed preacher of the Word in 1861. He then moved on the field to serve Westminster Presbyterian Church, Old School, Keokuk, Iowa, where he was ordained and installed in November 1862. As a result of the reunion of the Old and New Schools in 1869, the Westminster Church united with the former New School church in Keokuk to form a single congregation of the reunited PCUSA. Rev. Craig continued his work as a congregational shepherd in Keokuk for twenty years while his church increased in size during his ministry. Rev. Craig was influential in Iowa not only as a minister but also in the fields of general and theological education. 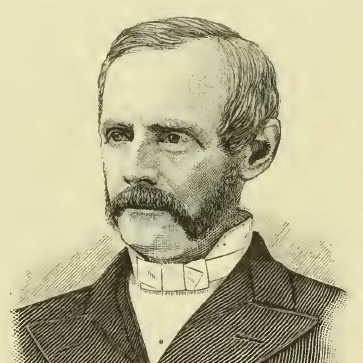 He was involved in 1875 with the opening of Parsons College in Fairfield where he served on its board of trustees for thirty-one years including a few years as its president. His commitment to church oversight of theological education was exhibited in his membership on the board of directors of the Presbyterian Theological Seminary of the Northwest (McCormick Seminary) in Chicago for ten years including one year as president. Dr. Craig’s term as president of the seminary board was complicated by continuing financial difficulties resulting from campus reconstruction made necessary by the Great Chicago Fire of 1871. Craig continued working on the McCormick board until 1881 when his relationship to the seminary changed. He was elected to the seminary professorship of Biblical and ecclesiastical history. His congregation initially opposed his leaving, but the following year a renewed effort to obtain his services convinced his flock to let him leave f or his new call beginning in the fall of 1882. In 1886, the seminary was renamed McCormick Theological Seminary in honor of its farm equipment inventing benefactor, Cyrus H. McCormick. Dr. Craig shifted from teaching church history to the Cyrus H. McCormick Chair of Didactic and Polemic Theology in 1892. 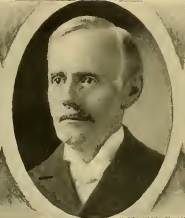 After a total of almost thirty years in Chicago and only a few months after becoming professor emeritus, Willis Green Craig, DD, LLD, died on July 4, 1911. His body was returned to his blue-grass homeland in Danville for burial. When Dr. Craig was first elected to his professorship in the seminary in Chicago he was selected for one of three vacant faculty positions. One of the other two positions being filled was the Cyrus H. McCormick Chair of Didactic and Polemic Theology. The man initially selected for the chair was B.B. Warfield who turned the opportunity down to continue teaching New Testament in Western Theological Seminary in Pittsburgh. If Warfield had taken the McCormick Chair his tenure would have followed the ten years served by Francis Landy Patton. For about three years in the late 1880s, McCormick Seminary’s professor of apologetics and missions was John DeWitt. Another familiar Presbyterian serving in McCormick Seminary in the era was adjunct and then professor of church history J. Ross Stevenson. Both DeWitt and Stevenson left McCormick to continue their teaching in Princeton Seminary. For a bit of speculation, what if Warfield had accepted the invitation to McCormick Seminary, Patton and DeWitt remained there with him, and J. Ross Stevenson followed through with his move to Princeton? Would the Princeton theological perspective have moved west to Chicago? Which seminary would have been preferred in the 1920s? If the events had happened as proposed instead of as they did consider this–in 1890 Princeton graduated 52 and McCormick 34; in 1900 it was 72 and 51; the next decade, it was 46 and 28; but by 1920, it was Princeton 31 and McCormick 42. McCormick and Princeton were the two largest of the thirteen seminaries operated by the PCUSA, with Cyrus McCormick’s seminary having a graduating class size surpassing that of the seminary founded by his fellow Virginian, Archibald Alexander. Notes–Articles associated with W. G. Craig that are available on Presbyterians of the Past include: “Pearl Harbor 75th Anniversary, Chap. T. L. Kirkpatrick” which is about a Pearl Harbor casualty who attended McCormick Seminary, and the two part article about “N. L. Rice, 1807-1877,” who was a professor at McCormick Seminary (the second part is linked at the end of part one). The Presbytery of Sangamon was in the Old School Synod of Illinois. Keokuk is just across the Mississippi River from Hamilton Illinois and the fertile farmland west of Chicago. Maybe Dr. Craig preached in a Hamilton church during his brief licensure and then accepted the call across the state line in the Iowa Presbytery. 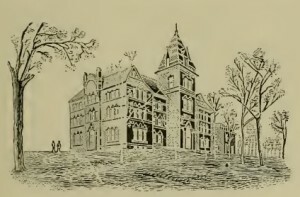 Sources–The oval photograph of Craig and the sketch of the building on the Parsons College campus were found in, The Presbyterian Church in Iowa, 1837-1900, Prepared by Committee of Synod of Iowa, 1900.